This small circuit board was our original business card. It was born out of the repeated experience of trying to convince cellular clients that their transmitter’s radiated spurious harmonics were probably re-radiated. Often, RF engineers assume harmonic spurs come directly from their transmitter and radiate from the device’s antenna. While this can be true in many cases, it is not always the culprit. In “higher power” transmitters (say 1 Watt and above), semiconductor parts located near an embedded antenna can rectify their near field induced RF currents and produce additional “products”, like intermodulation or radiated spurious harmonics. 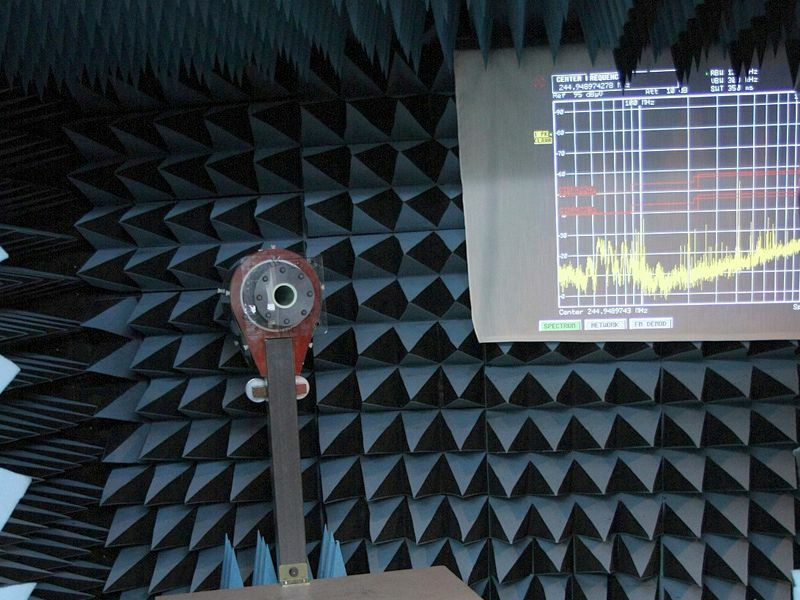 In the Antenna Test Lab anechoic chamber, there is a 5 foot projection screen used to display real time spectrum analyzer results. The demonstration would be as follows. 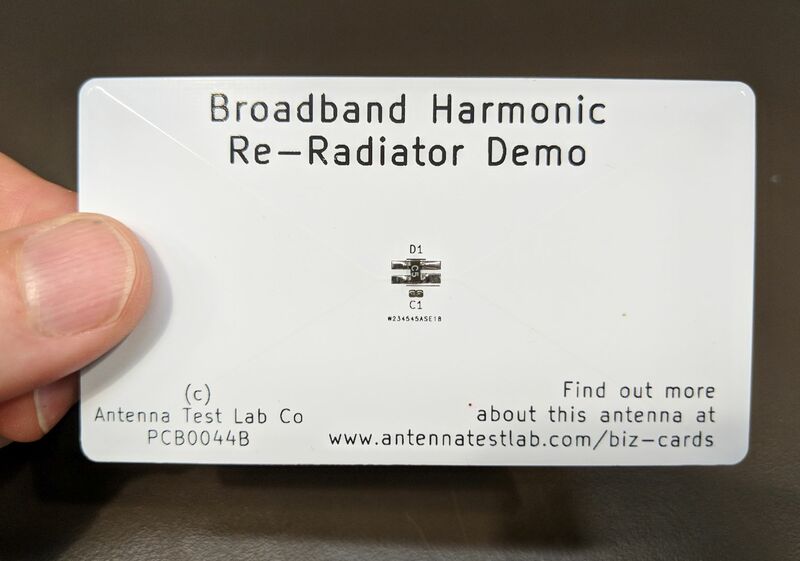 While looking at the first or second harmonic level in real time on the big screen, this “business card” can be moved into proximity of the live transmitter and raise the radiated harmonics to well above legal limits. It was always living proof to those who doubted re-radiation products, and helped us focus on resolving radiated spurious emissions problems. The biz-card PCB is a broadband shaped biconical antenna with a diode at the center. Induced RF current is rectified to create non-linear products, which in turn re-radiate and are picked up in the far field as compliance failures. The card is passive and does not have a battery or transmitter. Yet its proximity to a transmitter can cause excessive spurious emissions. There is also a pad location on the card for an 0402 capacitor. Simply placing 10 pF in this location effectively “shorts out” or decouples the RF diode and fixes the “problem”. The same is done on the customer’s circuitry, now that they understand the problem !